This is one of the most difficult and challenging hikes on Kauai. Follow in the footsteps of ancient Hawaiians. This 11 mile stretch of coast is the original trail used by the Hawaiians who lived in Kalalau Valley and other valleys along the Napali. The Kalalau Trail provides the only land access to the Napali Coast on Kauai. This trail will take you on an ultimate journey as you ascend from 4,120 feet elevation in the Kokee State Park to the valley rim of Nualolo and Awa’awapuhi valleys at 2,500 feet. The trail will lead you through rain forest, high desert like terrain and to some of the most awe inspiring vistas on Kauai’s Napali Coast. Awa’awapuhi Trail is a continual downhill hike from the trail head to the grassy clearing overlooking the valleys. The Napali Forest Reserve area is managed as wilderness because of the rich variety of native plant species that thrive here. After the first mile-and-a-half the forest begins to thin out and the rugged Napali coast comes into view as well as glimpses into the Awaawapuhi Valley. At about the three mile mark is the junction of the Nualolo Cliff Trail. If you don’t like back tracking you could take the Nualolo Cliff Trail junction on your way out, but it will add 5 miles to your trip and you will have to walk the road back to your car. For the Awaawapuhi Nualolo Lookout continue straight ahead to the end of the trail for spectacular panoramic views and great picnic area. At the end of the road (Hwy 560) Kee Beach on the North Shore is the starting point of the Napali Coast and Kalalau Trail. The hike to Hanakapiai beach is by far one of the most beautiful trails in all Hawaii. The first two miles of the Napali Coast trail is breathtaking. 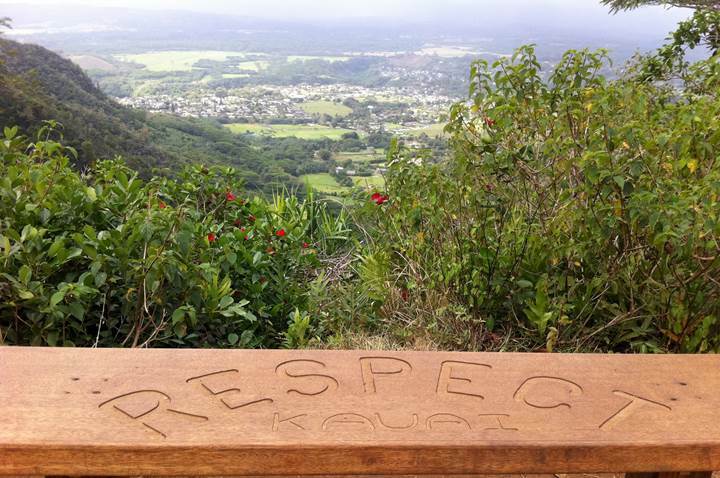 The Hanakapiai Trail will climb steadily for the first mile to an elevation of 400 feet. Don’t let this discourage you, as soon as you reach the first ½ mile vista, you will be rewarded with sweeping views of the Napali coastline and an aerial view of Kee beach and the coral reef that creates the protective lagoon at Kee beach, perfect for snorkeling during the summer months. As you make your way along this portion of the Kalalau Trail you will switchback from coast to valleys, over fresh water streams and waterfalls. As you make your final descent into Hanakapiai Valley you will discover jungles of twisted vines, wild ginger, banana’s, guava, varied Ti plants and at the end the cool waters of Hanakapiai Stream. The crystal clear river that flows from the falls two miles up river is a refreshing reprieve for tired, hot and muddy feet. Cool off in the river the ocean here is NOT for swimming. During heavy rains and high surf this trail can be extremely dangerous near the river and the shorelines. Do not attempt to cross the river during heavy rains. Flash flooding can occur without notice. The Kuilau Trail is a great walk for enjoying the many species of plant life on Kauai. Follow the old road that turns into a trail that leads you to amazing panoramas of Makaleha Mountains. 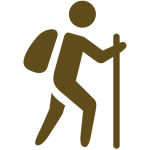 The beginning of the trail will introduce you to a variety of native and non-native plants. At about the one mile point you can take a break in a grassy field bordered by an Ohia forest, a picnic table and sweeping views of lush valleys and Mount Waialeale and the Makaleha Mountain Range. The Kuilau Trail connects here to an east route that meets up with the Moalepe Trail. Further down the trail you will come to a wooden footbridge which crosses the Opaekaa Stream. The Kuilau Trail is located in the Keahua Arboretum. Follow Hwy 580 through the rural neighborhoods of Wailua and up into the forested park area of Keahua. The trail begins just before the park area on the right. Designated parking for about three cars is available. If parking is full drive a bit further and more parking is available within a short walk. The Kukui Trail is is found at the beginning of the Iliau Nature Loop Trail. 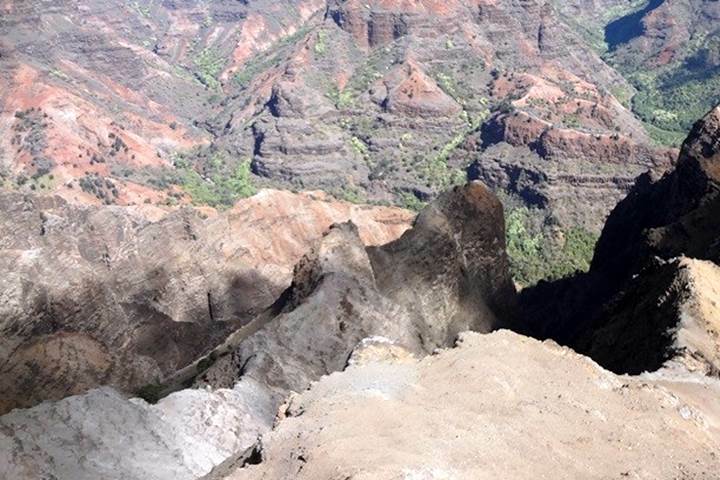 This hike will take you into the Waimea Canyon. The trail is used by hunters and horses and can be loose. As you follow the Kukui Trail into Waimea Canyon, along the first mile you will be treated to two amazing opportunities for photos, each with a bench to rest your feet. Across the canyon you will be able to see sweeping views of several waterfalls. Waialae Falls is the dominant waterfall that cascades to the valley floor. Don’t let the 5 miles fool you, steep ascend can be exhausting along with the sunny and hot conditions. Keep hydrated and don’t wander off the trail, the forested area can become disorienting. If you have someone to drop you off you can follow the Waimea River back to town and the ocean. Bring an ample amount of water, sunscreen and bug spray. Wild goats are frequently visible along the canyon ridges. Route: The Kukui Trail starts along Highway 550, about 0.75 miles beyond the 8-Mile Marker. Kukui Trail is a scenic trail down the west side of Waimea Canyon. It makes a 2000 ft. elevation drop to the canyon floor ending at the Wiliwili Camp site administered by the Division of Forestry and Wildlife. is a special part of Kauai History Heritage sight and the last stretch of accessible coastline on the south shore that has not been developed. Malama Mahaulepu is helping to effort to keep this place undeveloped and preserve the natural beauty for all to enjoy. The Mahaulepu Heritage Trail is a great coastal hike that takes you from the south east corner of Shipwreck Beach Keonela Bay along sand-dune cliffs, Kiawe trees, limestone formations and rocky inlets that are an occasional safe haven for marine life, such as sea turtles and the endangered Hawaiian Monk Seal. Mahaulepu Beach is remote and rugged and the ocean here is usually rough and more suited for whale watching, beach combing and hiking. This is a sacred sanctuary that needs to be preserved. Tread lightly and leave only footprints behind. The Moalepe Trail on the East Side of Kauai offers wonderful views of the green jagged ridges of Makaleha and far off ocean views. The trail-head is at the end of the pavement on Olohena Road in the upper Wailua Homesteads. 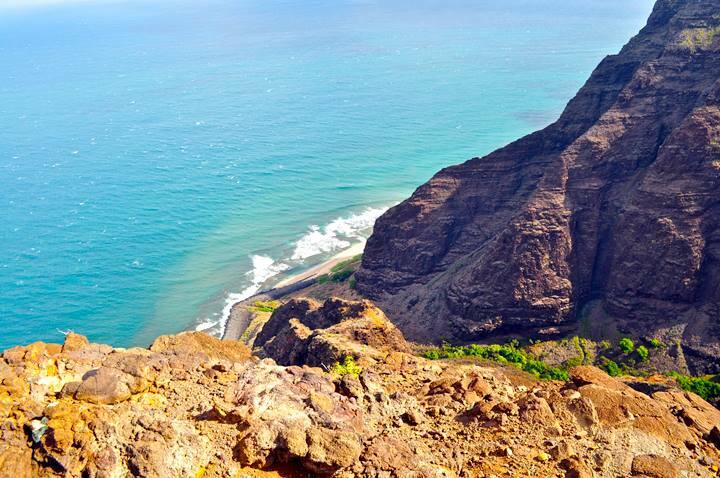 The fist part of the hike you will enjoy ocean vistas, views of the Anahola Mountains and Kong, and close-up views of the Makaleha Mountain Ridge. or Sleeping Giant Hike starts out in a neighborhood known as the Wailua House-lots at the top of Haleilo Road near the water pump station. This east side trail has a rapid elevation gain of 1,000 feet and an ocean-view behind you the entire way up. This trail is drier and will have better footing during a rainy period, than that of the other Sleeping Giant trails is lined with flowering low lined shrubs compared to the shady forested side of the West Kuamoo Trail off Hwy 580. The east side trail will meet up with the west trail at about .25 miles before the top. “Sleeping Giant Trail” is named so because the shape of the mountain is a giants profile lying down. The hike to the top takes you across the chest of the Sleeping Giant. This is seen more clearly from the Nounou East Side Trail or ocean side of the mountain.